Jan. 29, 2012 -- CarePrecise announces a major upgrade of its CP ListMaker software that puts all 3.5 million U.S. healthcare provider records – including almost one million physicians – in reach for marketers. Now includes practice group data to help qualify sales leads. Today we announced a new version of our popular CP ListMaker software, our desktop system that puts all of the 3.5 million healthcare provider records – including approximately one million physicians and tens of thousands of hospitals and ambulatory care facilities – at the fingertips of researchers and marketers. CP ListMaker allows users to pull tightly targeted lists of physicians and other providers based on criteria such as specialty, subspecialty, facility types for organizations, provider gender, wealth/poverty of service area, Medicare enrollment, and many more. The new version, CP ListMaker 3.5, unveils new practice group data, and does it in an interesting way. Until now, it has been difficult to find data indicating provider’s practice groups. With new data now obtained from Centers for Medicare and Medicaid Services (CMS), combined with CarePrecise’s advanced record linkage system, CP ListMaker identifies practice groups, and can list all of the providers working at each practice location. The “Co-location codes” attached to each record make it possible to further qualify potential prospects for companies marketing to the medical community. Not only physician practices, but dental groups, behavioral services groups, and all other HIPAA-covered healthcare providers are co-location coded. The new CP ListMaker offers tools for using the new data. For example, to export a list of obstetric/gynecology group practices of between 3 and 20 members. CarePrecise’s record correlation processes also make it possible to link providers’ PECOS and LEIE records with their NPI (National Provider Identifier) records ( http://www.careprecise.com/pecos-npi ), providing a rich master record ( http://www.careprecise.com/master-record ) that can be used to enrich or update customers’ existing databases. The PECOS data (indicating which providers are enrolled to be able to bill Medicare) has recently been redacted by CMS, now providing only a partial NPI number; however, our system restores the full NPI number. The federal List of Excluded Individuals/Entities (LEIE) database, which lists providers who have been barred from billing federal programs due to fraud convictions or other infractions, also has no unique identifier as distributed; however, CarePrecise links the LEIE data to the NPI data with each monthly update. 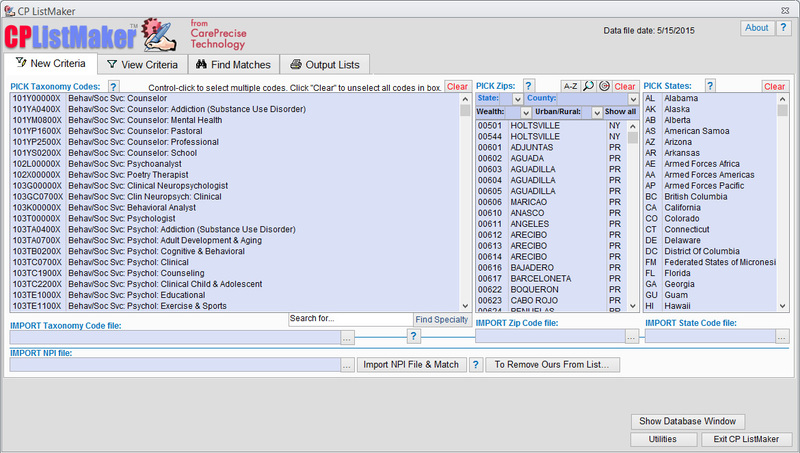 With or without a unique identifier, such as an NPI, EIN, UPIN or OSCAR -- or even a telephone number -- the CarePrecise master data management system, known as SQUIRRelate (http://www.careprecise.com/master-data-management.htm ), can pull provider data togetherinto a master record database from diverse sources. The company offers boutique record linkage services that can be used to merge data acquired during mergers and acquisitions, through cooperatives such as Health Information Exchanges, or from multiple in-house systems. CP ListMaker is available as part of the CarePrecise Gold bundle, which includes CP ListMaker and the full U.S. healthcare provider database, or separately for customers who already subscribe to the CarePrecise data. The tool runs in Microsoft Access 2003, 2007 and 2010, and is provided open source, making all of the Access tools available to users.